So, without further ado, let's get readin'! 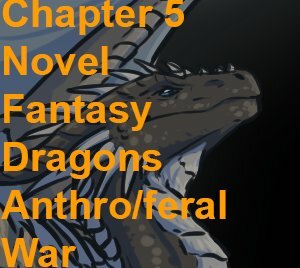 Chapter description: Aleks and his dragon hatchling, Nyrisa, have been assigned to a distant outpost close to the enemy lines. Their life starts to have a semblance of normalcy, and Aleks uses the uneventful evening to teach Nyrisa about his craft. "Cast your eyes from them. They're not worth your attention." Aleks reached out for the straying hatchling for the third time to collect her in his arms. Nyrisa squeaked and squirmed, protesting against being held captive, but eventually, she simmered down. "What attracts you to them anyway?" Aleks said to her limp, gruff form, trying to better understand her mindset. "They're just a bunch of drunks huddled around a fire, sharing tales not meant for a dragon of your age." The little hatchling snorted a wisp of white smoke, churring in disapproval. Now that her thrashing stopped, her wings folded neatly at her sides, flowing over Aleks's hands like violet swaths of unblemished silk. Aleks understood the stinging curiosity that kept her on her feet, that insatiable thirst to drink deep of what the world offered. It was why he had to keep Nyrisa sheltered, lest she lost her to his betters, with no way to ever lure her back into his arms. It was a selfish philosophy--callous, even, but Aleks's years compared to her single month of life held undisputable wisdom. He had heard of hounds--pets to the humans occupying the far corners of the world--gorging upon a lavish meal until the point of bursting. An odd lesson, to be sure, but one that evoked the dangers of careless indulgence. "We'll see more of the world," he vowed to her, stroking along the tiny frill of her crest with the tip of his forefinger. "But to do that, we must always remember our duty. We're Snowfangs. Warriors. Not poets, bards, actors." If Nyrisa noticed the tinge of spite coating his words, she showed no signs of disagreement. Lodged between two houses and drenched in the penumbra cast by the wiggling lanterns hanging from the beams of their porch, Aleks enjoyed his solitude. During a battle, teamwork might mean everything to a Snowfang, but every warrior had the right to spend their leisure time as they deemed fit. For Aleks, that meant remaining nigh invisible until the inevitable call at arms. The same couldn't be said about his dragon. Nyrisa gawked at the gathering in the village's center longingly, the scents of sweet drinks and roasting meat making her stomach growl. Though the soft rumbling sound, akin to a purr, didn't carry over the din, Aleks felt the soft vibrations tickle the pads of his fingertips, each wave more devastating than the last. How could a lonely, antisocial wretch like him explain to his precious charge that fear kept them away from the celebration? More importantly, why would Nyrisa even remain his once her fangs pierced the veil of lies to taste his inherent weakness upon the tongue? He had had her for but a month, and every day had been a stumble into the next. Aleks possessed but a sliver of the spiritual fortitude most Snowfangs took for granted, barely enough to mobilize himself, let alone indoctrinate Nyrisa into the life of a warrior. On that regard, they were both equally young and inexperienced. "They are not actually drunk," Aleks relented. No point in keeping this charade going, now that Nyrisa's acumen grew sharp enough to draw her own conclusions from their coherent songs and merry laughter. "But they might share questionable tales with each other. Look," he pointed at a fully grown brown dragoness sharing licks with a raven-black wyvern whose pink showed between the legs. "As expected, those two take the song far too literal." He didn't shield her eyes; Nyrisa was a dragon, not a child, a tricky distinction even to a Snowfang. Be too lose with the information distributed to your hatchling, and she would pick up a plethora of bad habits. Lock her in a cage gilded with platitudes, and she would hesitate before every hard choice laid before her. Fortunately for Aleks, the revelry didn't descend into crudeness. The wyvern's companion, a burly white bear, slapped the arousal straight from the wyvern's head. The smack was so hearty across his scaled neck, even Aleks heard it. "Keep yer meat where it belongs, ya daft skink. Alrica's singing. Show some self-restraint." The grey wolfess nodded her head appreciatively and resumed plucking at her lute, her suave voice once again delighting her audience with the tale of the human who freed and fell in love with his former gryphoness slave. The dragoness rubbed herself against the wyvern, coiling her tail about his neck to lead him away, the creature's anticipation once again visible under his tail. Nyrisa ignored them this time around, enraptured with the ballad. Once a forward outpost for the Icehowlers, Lothering had grown into a small village over the past decade, courtesy of its position in a dry, lifeless gorge. Supplies arrived mostly by way of wings, a luxury that Lothering could only afford due to its several wyvern families sharing its lands. Barren as the gorge was, wyverns often preferred safety over the accessibility of prey, and with magic in place to seal the top of the gorge from the battering winds, Lothering soon became a home to them. Several hatchlings, each colored a different hue, had tentatively passed by Aleks and Nyrisa. She warbled her cordial invitation at them, but the half-wild wyverns had an innate distrust of lone strangers, and Aleks arrived in Lothering only a week back or so. Almost every villager, along with the aforementioned hatchlings, surrounded the roaring bonfire erected in the center of the village. The people had brought all of the chairs they could find, tables included, to create an Amphitheatre for the artists and storytellers. Aleks resented the Wayward Day, and fate deemed it fit to mock him by seeing him to Lothering just in time for this loathsome festivity. He couldn't care less for the deeds of others, alive or passed into history, yet Nyrisa kept her head craned, frills perked, absorbing every word of every verse. "I am an artist too," Aleks tried to distract her from the monotonous chant, stroking her petite neck and chest with his forefinger. "Curiously enough, my craft is considered to be the most useful during these troubling times, yet what is a sword, mastered by many, to a lute, plucked by few? Blades don't sing nor recount exciting tales. They just kill." Nyrisa's crest frill twitched ever so slightly to denote the faintest sign of interest, but his meaning flew right past her tiny head. Aleks sighed. For now, all he could do was stroke the wings and pebbly scales of his little one, coping in silence with his too many lacks. Were he to join the throng of people and animal companions alike, they might expect him to take the stage on account of his loathsome heritage. Aleks, third son of their chieftain, invited to show proof of talent. His pads began to sweat at the mere notion of that, his weakness manifesting in the form of that despicable sogginess. He didn't need artistic talent. He didn't need the praise of strangers, the encouragement of friends, or the warmth of a lover. Not when he had Nyrisa. He had resolved to be the companion she deserved, even if that required the expert hiding of that ugly, impotent side of him until the proper time for explanations arrived. Right now, she was too young to fully comprehend the complex details of his upbringing, and an untimely misunderstanding might very well see them to an early demise. "You are growing more beautiful with each passing day," Aleks whispered to his distracted hatchling. Her pupils swelled to dark disks in the dim light, her eyes as bright and clear as the midday sky. Both her ear and crest frills stood on end, displaying the soft, purple membrane bridging the dark, sharp spines adorning the end of her cheeks, crest and back, all the way to the tapered end of her tail. Midnight scales, soft and tiny, adorned her body, growing even smaller and smoother still along her neck, belly, and underside of her tail, where they borrowed the purple nuance of her frills. The inside of her wings bore a similar color, while the top remained a stark black to imitate the night's shadow. A pair of small and surprisingly sharp horns crowned the top of her head, right behind the eyes, shadowed by a second pair of longer, equally smooth horns growing at an upward, elegant slant. They punctured Aleks's palm pads in more than one occasion, as did the little horn tipping her snout. As if to compensate for the fearsome aspect of her head, Nyrisa's feet resembled those of a feline, with four toes on both fore and hind paws. Her silky smooth and surprisingly warm paw pads had the same purple shade as her frills, as did the opaque claws jutting from the slits tipping each toe. Ironically, Nyrisa's claws had never drawn Aleks's blood, her control over the pressure exerted on whatever she grabbed fascinating Aleks to this day. One had to be wary of the pointy wing talons at the top of each wing, or the claws embellishing the lower extremities of each wing digit. Unlike her claws, she had little to no control over those, and Aleks had learned of that the hard way. Still, a hatchling her size hardly posed a threat to an adult of any species, bipedal or quadruped, predator or prey. Being the size of a two months old wolf pup, Nyrisa comfortably fit in his lap, arms, knapsack, or even on his back. On numerous occasions, the hatchling hooked herself there, foreclaws dug into his shoulders, hind claws puncturing the overcoat on his lower back, wings tucked or spread depending on her preference. She favored that position during a battle or a dash, and curled around his neck during less perilous times. That wasn't going to last long. Aleks figured that she would grow in size at a double rate compared to a wolf, and even quicker after her first year of age. He dared not think of that for the time being; an energetic, raucous creature such as her already strained his patience to its very limits without adding her first heat into the mix. Harmless as she appeared, Nyrisa was not without defense. Dragon hatchlings often figured out how to breathe fire during their first week of life, but Nyrisa went far beyond that. At just one month, she had discovered her inner pool of magic, as well as the basic means to mold it. Without a decent understanding of what responsibility implied, it fell to Aleks to keep Nyrisa in check, even if it meant becoming the target of her ire. "Mrreh," Nyrisa growled, turning in his lap to nuzzle the blue fur of Aleks's chin. "Rrrrrh?" "I must say, I'm glad you still remember on whose lap you lie," Aleks said, stroking her neck with the back of his forefinger. "So, you're finally ready to listen to the tale of Aleks Steelsong, eh?" "Rah!" Nyrisa squawked, rearing to hug his neck with her forepaws and rub her cheek against his. "Off me, then. Sit by the lantern light, so that I can unveil my full collection." Nyrisa jumped off him, dashing to her designated spot in leaping strides, bubbling with excitement. Once she settled onto her haunches with her head canted, Aleks unstrapped the knapsack from his back, splayed his cloak along the ground, and upended his knapsack over the dried leather surface on the back of his cloak. "You can come closer for these," Aleks signaled at Nyrisa with two curled fingers to help teach her the sign language of his people. "They are not all fashioned by me, but you might as well learn of the more instrumental tools of my people, in case you must procure them in the future." And so, Aleks proceeded to run Nyrisa through a whole list of items, starting with his blacksmithing hammer and tongs, to the tools crafted with their help. Unlike the more immature hatchlings who insisted to get their paws or fangs on everything, Nyrisa absorbed the information while walking in circles around Aleks, nodding or snorting in understanding. It would take several more months for their mental connection to strengthen enough to allow words through, but until then, Aleks was determined to expand Nyrisa's knowledge and lexicon to the best of his abilities. "Lastly, we have my sword, called..." he paused, scrutinizing Nyrisa for inspiration. "Sharphorn." Nyrisa cocked her head, a bemused expression on her face. She slumped forward to touch her horns with a paw, and then pointed her wing talon at his sword. A disapproving huff fled her. "It's more of a metaphorical name," Aleks said, scratching at the back of his neck, ashamed of his lack of creativity. "But it does live up to the first part of its name." He crouched to prop the blade on his knee, running a claw along its edge. "The steel has been folded thrice. It's what helps make it so durable." Nyrisa reached out with a forepaw to test the edge, but Aleks cupped her tiny paw in his fist. "Trust my word on this." To get her attention away from the blade, Aleks grabbed it between two fingers to turn the pommel in her direction. "The gemstone in there is a black opal with amethyst hues. I've set it shortly after we became companions. Seemed fitting that my sword bears the color of my dragon, yes?" Nyrisa eyed the gemstone from several angles. When she decided the coloring appealed her, she began to trill in joy, headbutting straight into Aleks's stomach, a storm of licks assaulting his face. "You're my inspiration for everything, little Nyrisa," Aleks said to her after she calmed down, holding her at arm's length by her middle. Many hatchlings would have puffed flames and thrash wildly while held as if they were a dirty stray puppy, but Nyrisa playfully grappled at his wrists with her toes, squeaking in glee. "But that's enough adventure for the day," he said, lowering her on the ground. "Place all of my tools in the knapsack, and then bundle up the cloak like I've taught you." Nyrisa never found a task too demeaning. For her, even a menial job provided cause for excitement, as well as opportunities to impress Aleks. After rolling two candlesticks into the knapsack with her paws and dumping the hammer clutched between her jaws, she guided the rest of the items inside using her levitation magic. She employed her powers on the cloak as well, the toll leaving her panting for breath and shivering. "That was excellent!" Aleks exclaimed with as much joy as he could sneak past his gnawing guilt. "Three months hatchlings have less precision than you, and you have even fastened the lace around my cloak to keep it bundled, which makes your prowess over magic even more impressive." He sheathed his sword, then hurled the knapsack across a shoulder to collect Nyrisa into his arms, draping his cloak over her frame to keep her warm. By the time he reached their bed, Nyrisa was already asleep. Hooray, you made it to the end! I hope you enjoyed this story ^^ If you like my works and wish to see me create more and diverse content, make a pledge on my Patreon for access to lots of early access content at least 1 month before it gets posted here. Aleks and his dragon hatchling, Nyrisa, have been assigned to a distant outpost close to the enemy lines. Their life starts to have a semblance of normalcy, and Aleks uses the uneventful evening to teach Nyrisa about his craft.